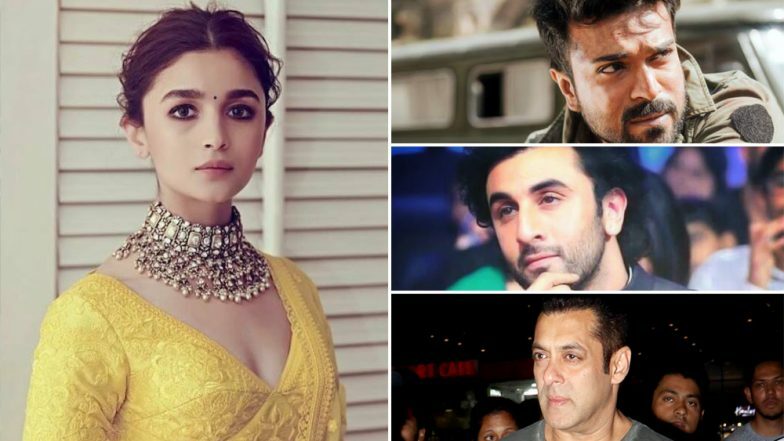 Alia Bhatt with Ranbir Kapoor, Salman Khan or Ram Charan - Which Pairing Are You Rooting For? Alia Bhatt is currently busy relishing her present and working hard for the future. She's successful in beating the likes of Deepika Padukone with as many as five upcoming projects in her kitty. While her contemporaries are taking their own sweet little time, she's busy picking the best and that includes some noted names like Karan Johar, SS Rajamouli and Sanjay Leela Bhansali. While there were reports about SLB considering Ms Bhatt for his next, the big news was confirmed today morning. Titled Inshallah, the movie will see her collaborate with Salman Khan and that's another piece of exciting news. From Signing Rajamouli's RRR to Working With Salman in Bhansali's Inshallah, It's Good Time to be Alia Bhatt! That reminds us, isn't the actress gearing up to romance three actors for the very first time on the silver screen? To start with, she has Brahmastra opposite her real-life beau, Ranbir Kapoor. Moving on, she'll mark her South debut with Ram Charan's RRR. And lastly, she has a trump card in Salman Khan's Inshallah. With such intriguing collaborations and unusually usual pairings, her fans would be eager beaver to witness her refreshing chemistry with these hunks. However, do you think her pairing with Ranbir will beat the ones with Ram Charan or Salman? Will the audiences fall in love with this real-life jodi or they will root for other options instead? Salman Khan in Inshallah, Shah Rukh Khan in Dear Zindagi – Alia Bhatt and Her Unusual Onscreen Pairings in Bollywood! Ya, we know she has Kalank and Takht in her kitty as well but that's with Vicky Kaushal/Ranveer Singh and Varun Dhawan individually. We have witnessed her chemistry with these actors in Gully Boy, Raazi and let's not even discuss Mr Dhawan. So the topic of discussion here is her fresh pairings and we want y'all to vote for your personal favourite. So go ahead and start voting. May the best man win. Which Fresh Pairing Are You Rooting For?